The meetings took place at New NATO Headquarters Brussels, Belgium on 3-4 October 2018 and were chaired by the NATO Secretary General, Jens Stoltenberg. There was a working dinner in the end of the first day, where it was discussed the fair burden and responsibility sharing in the Alliance, including the preparation of the national plans for increasing the military expenditure up to 2% of GDP. 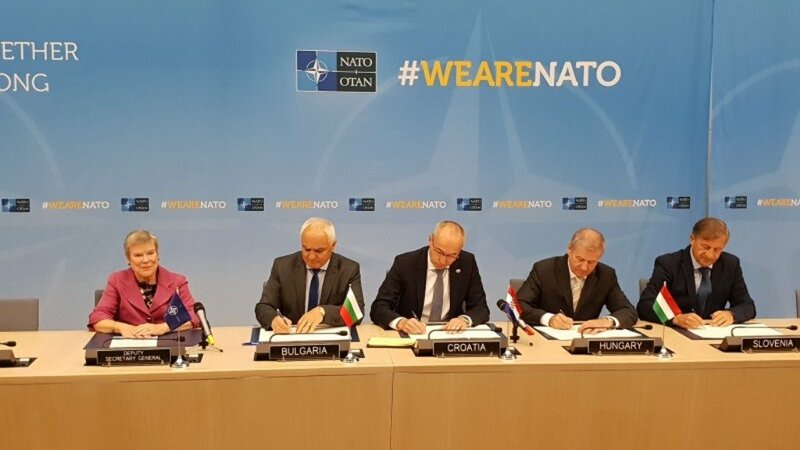 On the second day, in the morning, a Memorandum of Understanding was signed by the Defence Ministers of Bulgaria, Croatia, Hungary, and Slovenia on Multinational Special Aviation Program. NAC consists of Permanent Representatives of all member countries, who meet at least once a week. The Council also meets at higher levels involving Foreign Ministers, Defence Ministers (as was the case this week) or Heads of Government. It does not matter at what level the held meetings are. NAC always has one and the same effective political authority and powers of decision making, and the taken decisions have the same status and validity. NAC is the only body within the Alliance that derives its authority explicitly from NATO. The Council itself was given responsibility under the Treaty for setting up subsidiary bodies and thanks to that many committees and planning groups have been established in support to the work of NAC or for assuming responsibility in defence planning, nuclear planning, military matters, etc. All member countries of NATO have an equal right to express their views round the Council table. Decisions are the expression of the collective will of member governments arrived at by common consent. All member governments are party to the policies formulated in the Council or under its authority and share in the consensus on which decisions are based.